A power electronic module is directly screwed at the transmission bell housing. Therefore, this module has to sustain high vibration levels. For a first prototype, it should be investigated, whether these high vibration levels cause damages. In this case, measures to avoid these damages should be developed. The top figure shows the vibration model of the power electronic module. 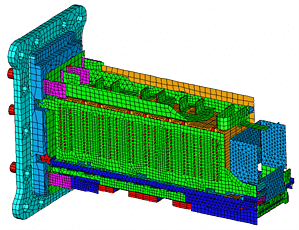 The model was built up successively by correlating the simulation results with results from experimental modal analyses for single components and sub-assemblies. 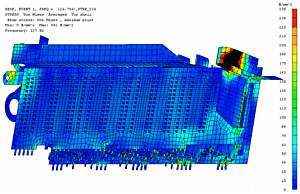 The complete FEA model reproduces the important natural frequencies of the module up to 400 [Hz] with an accuracy of better than 5%. As an example, the center figure shows the vibration shape at 127 [Hz]. The vibration model was used for simulating the dynamical stresses due to foot point excitation. The acceleration levels at the foot point were taken from the specifications by the vehicle manufacturer. The lower figure shows the stresses in the bus bars for foot point excitation in the cross direction at 127 [Hz]. For this and some further resonances, the stresses in the bus bars and in some soldering joints exceed the allowable stress of the materials used. This was validated by shaker tests. From the vibration model, measures for reducing the stresses could be derived. 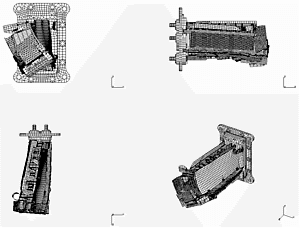 Those include reinforcements of the coupling of the module to the housing, of the connection of the inductor, which is located at the ending of the module and of the coupling between the bus bars and the front plate.